"Ladies and Gentlemen, Presenting the Fabulous Carrales Showband..."
Yes, this is "The Carrales Showband"! Thank you for visiting our web-site. We hope to be your SHOWBAND! We want to give you the music you want to hear! Feel free to browse our menu items. Please sign our guestbook and leave the name of your favorite song. You never know, maybe you'll hear us play it! We are more than excited that you have visited our web site. 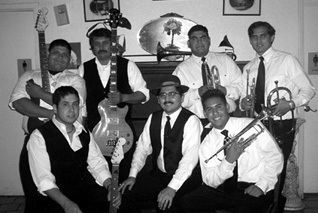 The Carrales Showband is here to provide unique musical adventures for any occasion. We are South Texas' most diverse variety band. Here you'll find information about our activities and performances, along with descriptions of our unique style and, most important, our music. We hope you will find all of the information you are looking for, but come again. Premont's greatest export, the Fabulous Carrales Showband! © The Fabulous Carrales Showband and all content of this web page are copyrights of Carrales Studios Productions 2001, 2002. All rights reserved.